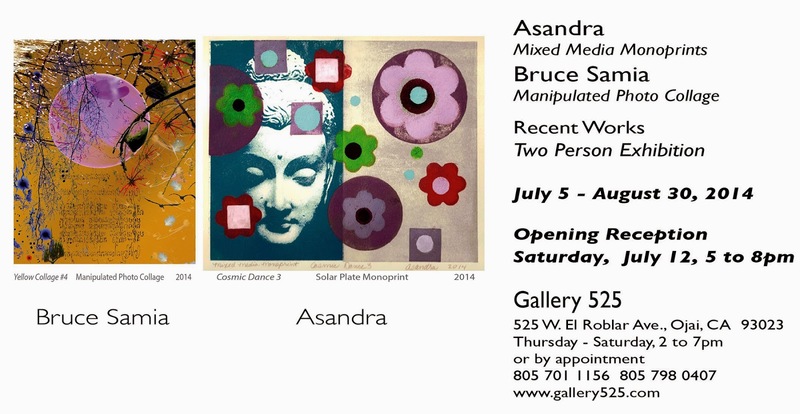 The following locations are upcoming events in which you can view Asandra's work in person. 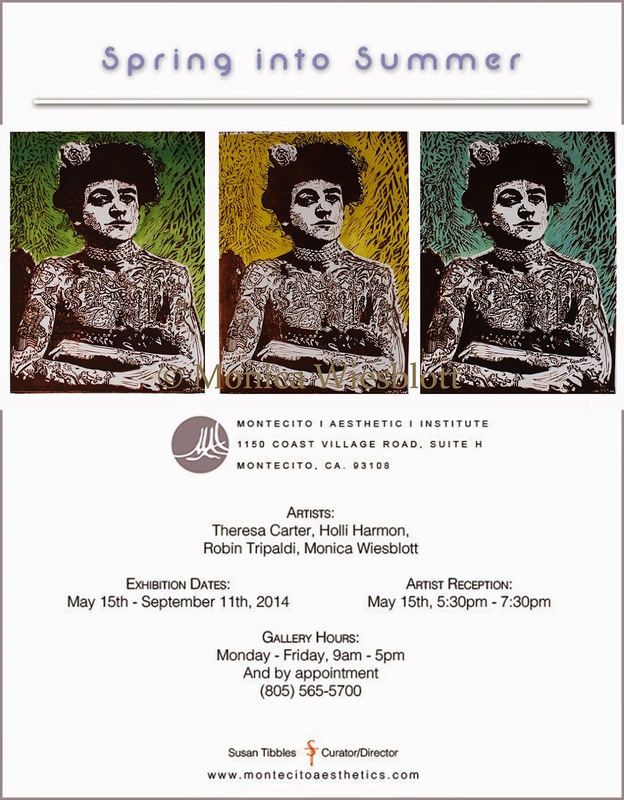 Christina Altfeld has been selected for inclusion in the 2014 Pacific States Biennial National printmaking exhibition. Out of 484 submitted entries, 50 works were chosen for the PSBN exhibition at the University of Hawaii at Hilo Campus Center Gallery. The gallery is located at 200 West Kawili Street, Hilo HI. 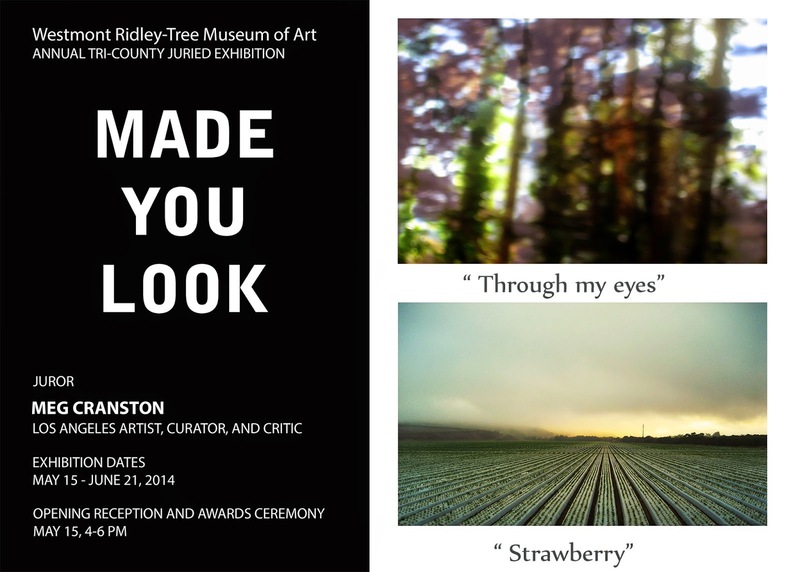 The exhibition opens on October 15, 2014 and closes on December 1, 2014.
at Westmont Ridley-Tree Museum of Art. This is an auction that benefits the Museum and it's programs. Printmaker Bay Hallowell often seems to surf around available and accidental influences and idea-triggers, which may give rise to a new series of expressions. Such is the case in her deceptively simple and enigmatic exhibition called “Marginalia,” now aptly nestled in the cozy nook of the Faulkner West Gallery at the downtown public library. In that small, long room, the artist can be found experimenting and improvising, visually mumbling and snooping in the margins of a good idea, shuffling letters and linguistic meanings, and generally ferreting out the theme of the very word of the show’s title. Using monoprints and stencils, collographs and other media, she stacks the letters and reorders them, scruffs them up, leaves them polished or affects them with sundry printmaking techniques. But whatever the variation or accentuation of each piece, “Marginalia” is the word in the epicenter of this artist’s playful arena. Artists have long been fascinated by the power of select words and phrases, fodder for treatments and distortions in a more visual than language-related way. Ed Ruscha has made a career out of painted, loaded words on canvas, and Jim Dine has found himself in love (ironically and otherwise) with the word—and heart-shaped symbol for—“love.” Deeper in art history, Bauhaus design notions explored the expressive potential of letters and Kurt Schwitters and other Dadaists and deconstructionist types have latched onto language for reuse and recycling in their artistic language. In this case, Ms. Hallowell has a ripe word to mess around with, as visual putty, having to do with the digressionistic scribblings in the margins of a text, or the quality of that which is presumably “marginal,” but possibly a case of profundity in the periphery. By virtue of the artist honing in on a very specific thematic target for her “variations on a theme” series, the word itself becomes a hypnotic blur. Following the progression and sequence of pieces, especially in those numbered 1 to 16, we intuitively sense a kind of quasi-narrative flow, through the investigations and reinventions. No. 10 has a dreamy, liquid-y overlay, while 12 finds the letters subjected to a mad scramble and fragmentation effect, rendered nearly illegible except as pure design, and 16 pits the word—in an early 20th century, Art Deco font—sandwiched between a warm yellow-orange-green foundation and the random ratatat of black dot-splatters on the surface. if you have a chance visit they are worth the effort. in the West Gallery of the Santa Barbara Public Library during the month of July. 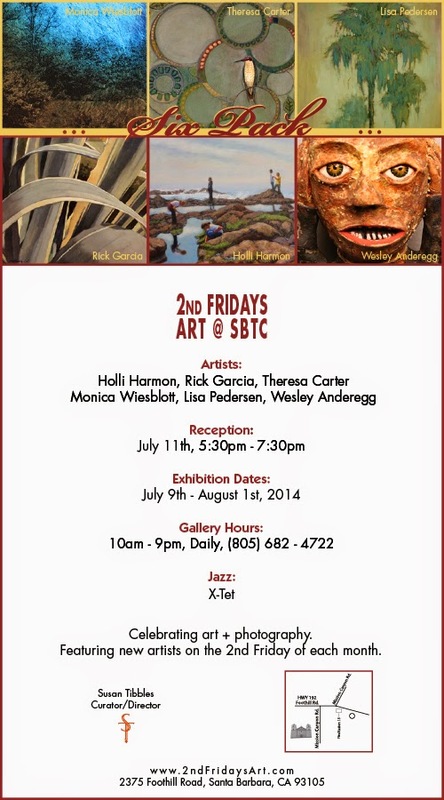 You are invited to attend a 1st Thursday reception on July 3, from 5 to 8:00 PM. 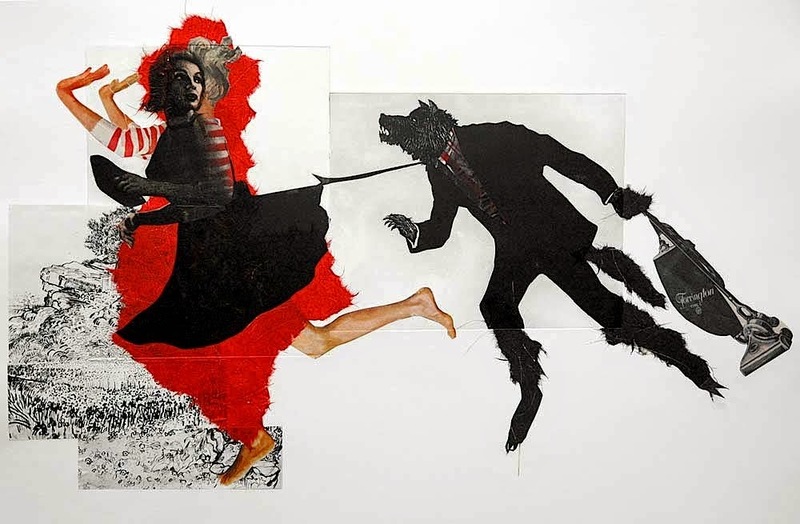 This series of unique monoprints was inspired by her unexpected encounter with the word “marginalia,” the title of an essay by Glenn Adamson in The Female Gaze: Women Artists Making Their World, an exhibition catalog published by the Pennsylvania Academy of Art in Philadelphia. 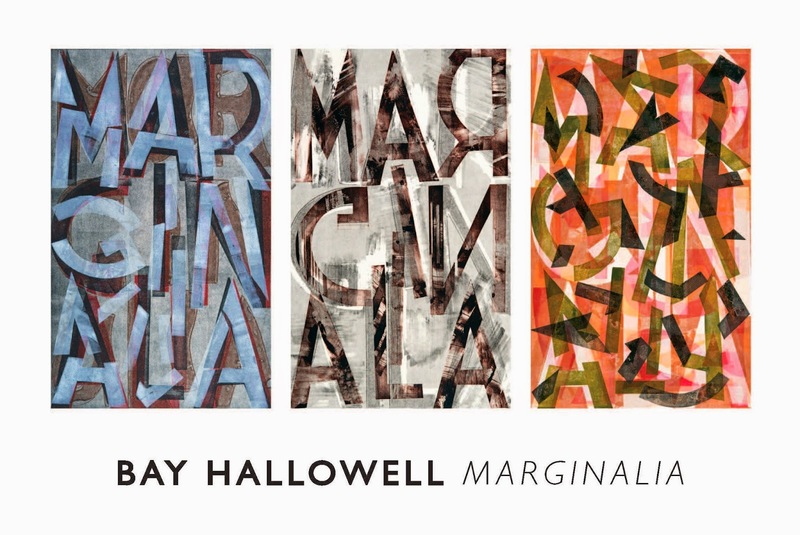 Throughout a year of printmaking, Hallowell created more than twenty dynamic, multi-layered abstractions of this word using stencil, collograph, and trace drawing techniques. She attributes her on-going fascination with words to the sense of pure joy she experienced when she first learned to read. For her, marginalia evolved from its dictionary definition and from Adamson’s metaphorical focus on women artists, to include a wide range of people, places, art objects and values located in the margins--on the edges--of whatever the main “text” was or is. 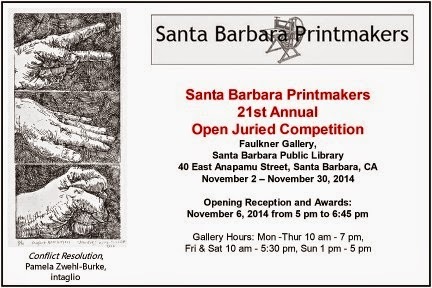 Hallowell exhibits her prints with the Los Angeles Printmaking Society, Santa Barbara Printmakers, Central Coast Printmakers, Inkspots of Ventura, Santa Barbara Art Association, and Goleta Valley Art Association. Her prints are collected on both east and west coasts and were recently featured in the Flat File Project at Jane Deering Gallery. Formerly a museum educator at the Philadelphia Museum of Art and the Carnegie Museum of Art in Pittsburgh, PA, Hallowell has taught and written extensively about art from many periods and places for diverse audiences. She studied painting, drawing, and art criticism at Bennington College in Vermont and completed her M.A. in education at the University of Pittsburgh. 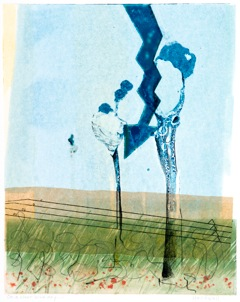 Shortly after moving to Santa Barbara in 2008, she began learning monoprint techniques from Siu and Don Zimmerman in Santa Barbara City College’s Adult Education classes. Marginalia are scribbles, comments and illuminations in the margins of a book (Wikipedia, 4/28/2014). JOIN US FOR "THE LAST HURRAH AT THE BLUE WHALE!" 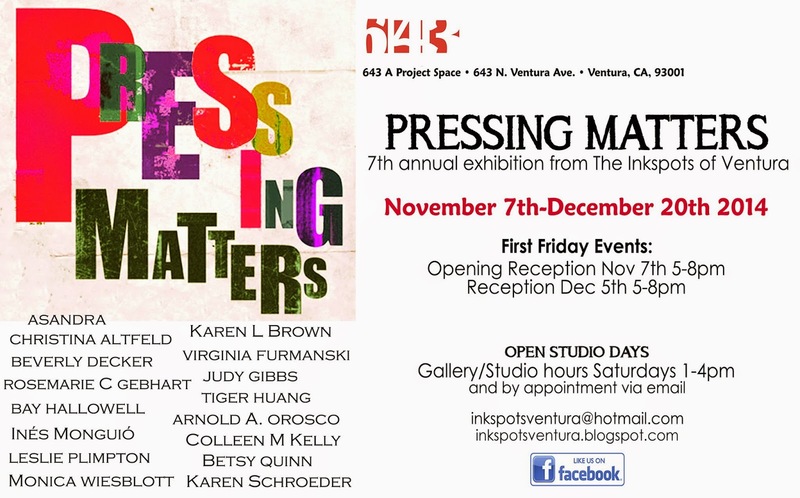 This will be the final exhibition at the LA Print Space, the gallery space of the Los Angeles Printmaking Society. 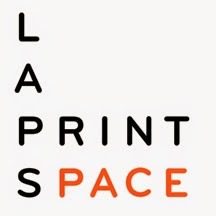 The LA Print Space focused on bringing exceptional contemporary print exhibitions to the Los Angeles public. This show will include 65 prints selected from nearly 240 entries from the national pool of artist members in this venerable print organization. 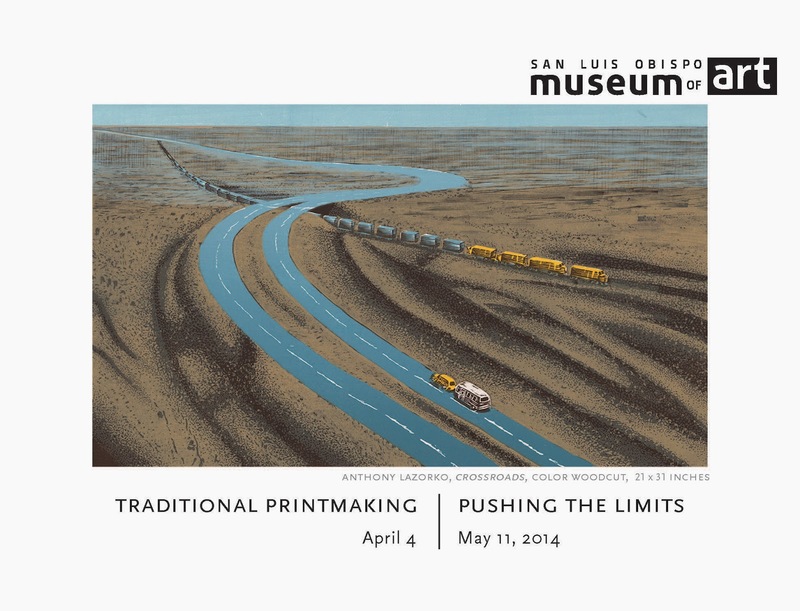 Viewers will be treated to a wide variety of accomplished prints using traditional and non-traditional techniques from letterpress to intaglio, artist books and collage. 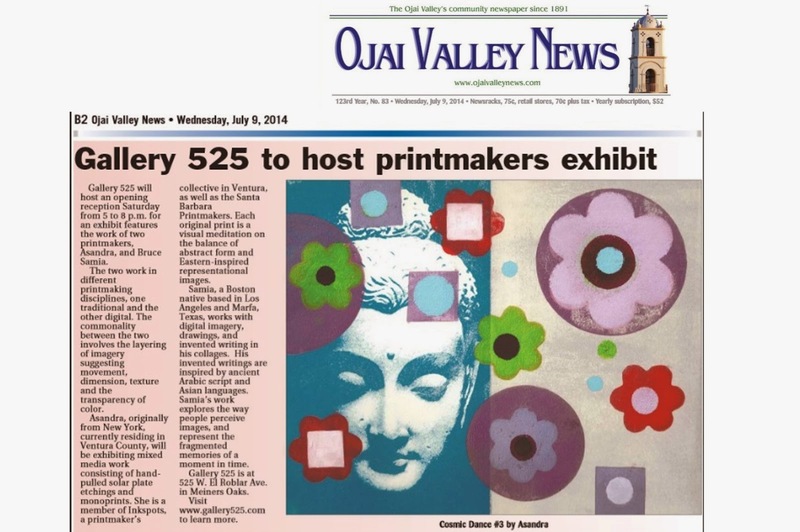 Artwork for the show was selected by long-time artist and former instructor at CSULB, Judy Chan. Judy Chan is well known for her mixed media works on paper and represented at numerous galleries and is in the collection of the Long Beach Museum of Art and the Japanese American National Museum. Join us for the last show at the LA PRINT SPACE of the Los Angeles Printmaking Society. 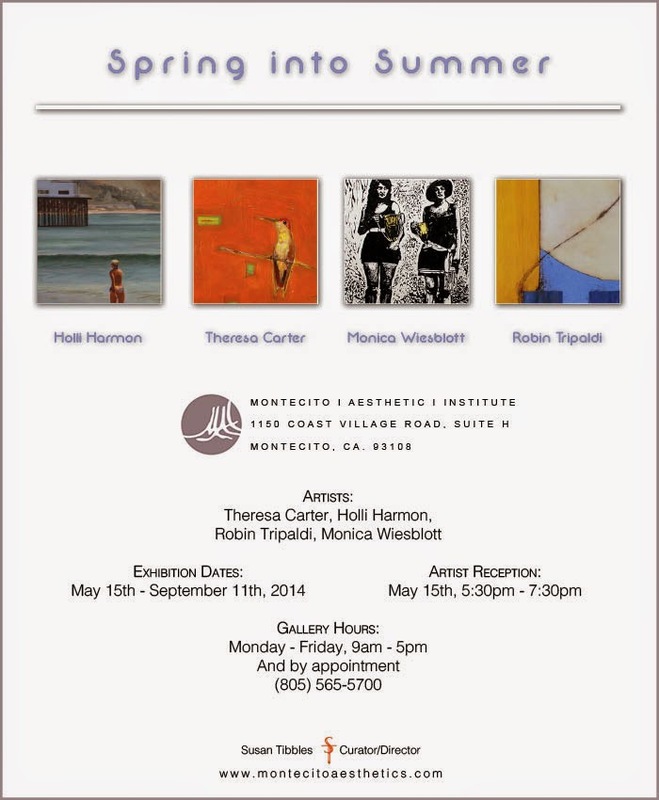 This is a juried membership show presenting work of the varied talents of our accomplished artist members. 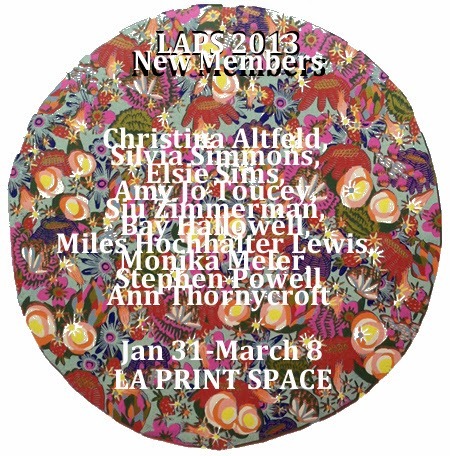 Work for the show was selected by juror, Judy Chan for this final exhibition at the LA Print Space. "Printmaking techniques are tools to create art that is unique to each artist. Old masters, like Rembrandt, made beautiful prints but those same printmaking techniques, and new methods and styles, should be used to express the world we live in today. I want the work to immediately capture my attention, whether it's a powerful visual statement or simply the beauty of the markmaking. There are so many variables today, in the printmaking genre, that it remains an exciting and beautiful art tool." JUDY CHAN is an artist who received the National Endowment for the Arts, Visual Artists Fellowship. 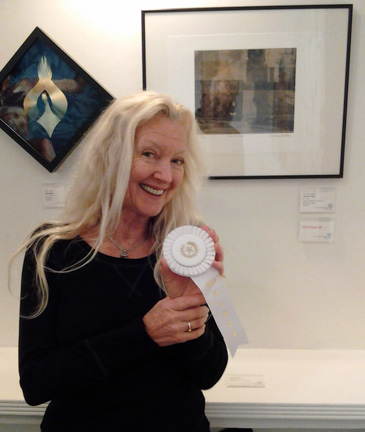 She received her MFA in Printmaking from California State University, Long Beach. Ms. Chan has taught Printmaking at CSULB, and at Long Beach City College in Long Beach, CA. She is also known for her mixedmedia, works on paper. She had several solo exhibitions including: Long Beach Museum of Art, Stone Rose Gallery in Long Beach, CA, Rogue Gallery in Medford, OR, Merging One Gallery in Santa Monica, CA, SCA Gallery in Pomona, CA, to name a few. Ms. Chan is in the collection of the Long Beach Museum of Art and the Japanese American National Museum where she currently has her art on display. 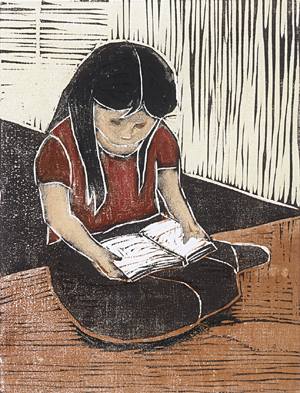 © Karen R. Schroeder, Silent Reading, woodcut, 14" x 11"
An elementary school is an unlikely theme for an artist unless you are an artist and a teacher. 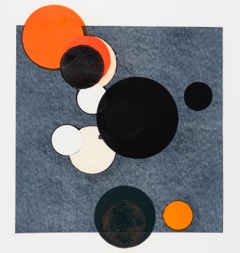 Artist and former teacher Karen R. Schroeder’s most recent work, It’s Elementary: Let Them Shine is on display at the Faulkner Gallery East, for the month of May. It is a show of innovative prints of children at play and in the classroom. This is an artistic peek into the lives of elementary school children, a time when they find out about themselves and should be encouraged to shine. These pictorial moments urge each viewer to appreciate this art work in a personal way and you may find yourself in these prints when you were young. There is a fascination with drawing in Schroeder’s work, but in a nontraditional way. She uses a rhythm and movement of line to create a narrative of a child’s environment that exists today and in yesteryears. 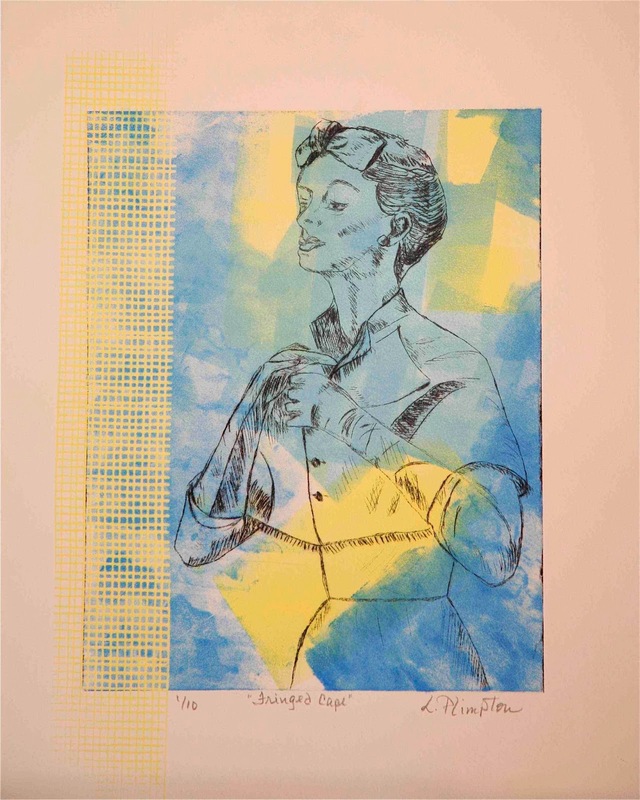 Schroeder’s use of diverse printmaking techniques gives variety to the subject as does her use of contrast. Some prints are monochromatic and others glow with bright colors. Some children are at play while some are absorbed in class work. As you view her prints you can see an Asian influence and at times one of American folk art. This contrast gives the show an appeal that is refreshing and unique. Schroeder’s prints tell a beautiful visual story of innocent charm. 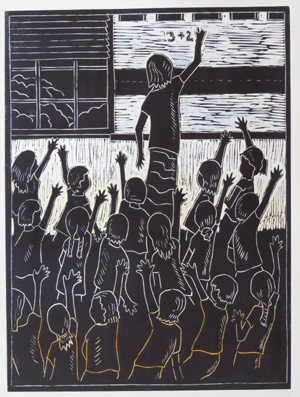 © Karen R. Schroeder, Every Hand, linocut, 24" x 18"
Mark your calendar and head for Prescott, AZ. 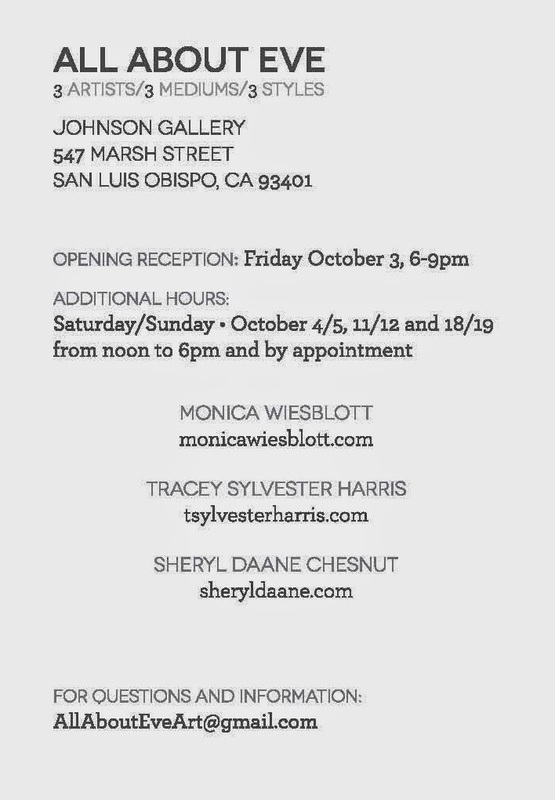 This is an invitation only exhibition. 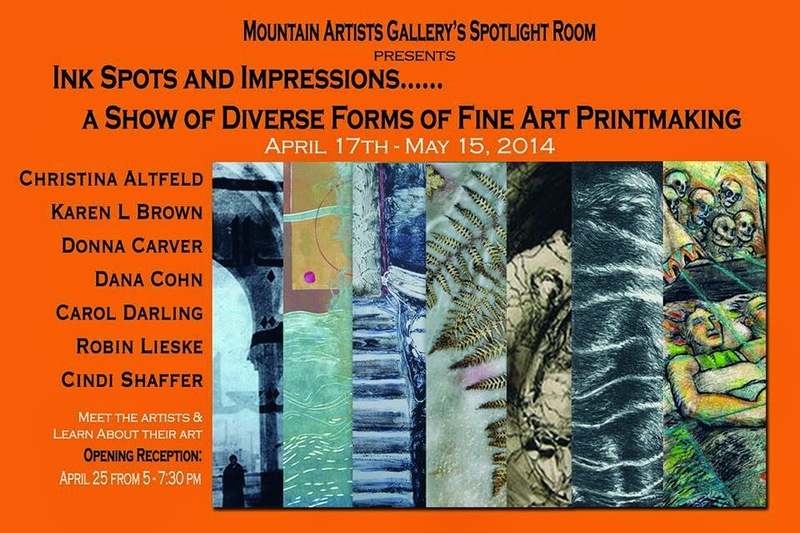 Ink Spots and Impressions....A Show of Diverse Forms of Fine Art Printmaking. Congratulations to Christina A. and Karen B.! The educational exhibition runs from April 17th through May 15th. In honor of supporting neighborhood businesses and vendors, Realty ONE Group Summit has partnered with a local group of artists, The Inkspots, by offering a gallery-type display of the group’s work. Realty ONE Group Summit is the fourth franchise location of a thriving company that is consistently on Inc. 500’s fastest growing companies in America. With more than 5,000 agents nationally, Realty ONE Group continues to attract agents with its innovative technology and compensation structure. 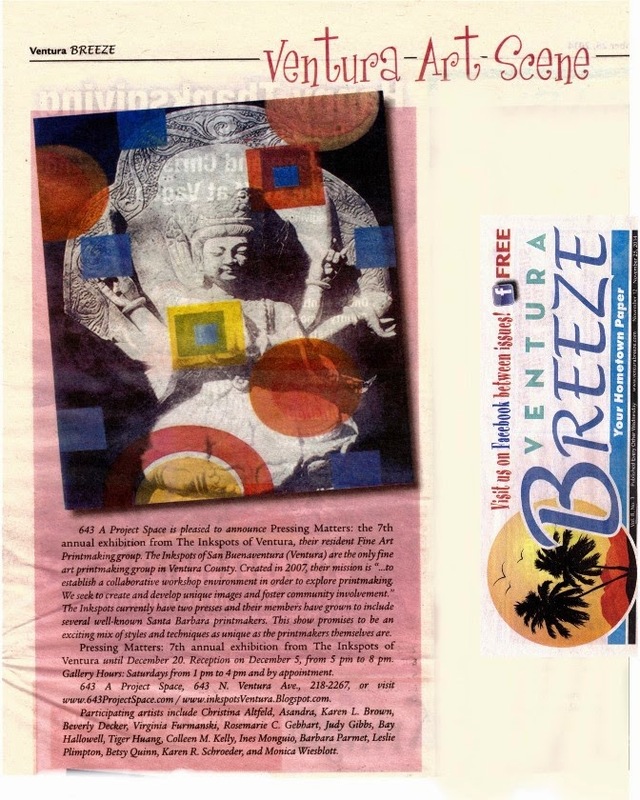 Established in 2006, The Inkspots of San Buenaventura brings area artists together to collaborate, explore and create works of fine art and printmaking. 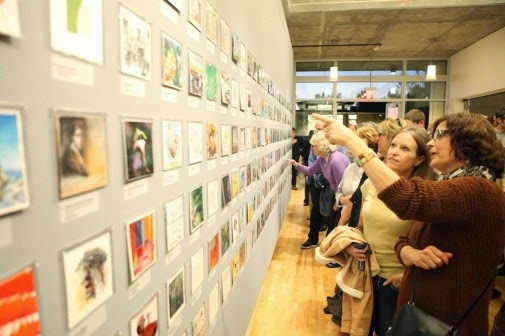 The displayed work includes colorful prints, collages and etchings. The Inkspots’ work will be displayed through March 31 at the office of Realty ONE Group Summit. The office is in Downtown Ventura at 940 E. Santa Clara St., Ste 100. The public is invited to visit the office and peruse the artwork, completely free of charge, Monday through Friday from 9 a.m. to 5 p.m. All of the art is available for purchase as well. Call 978-5764 for information. at the JCC SB Printmakers exhibition. 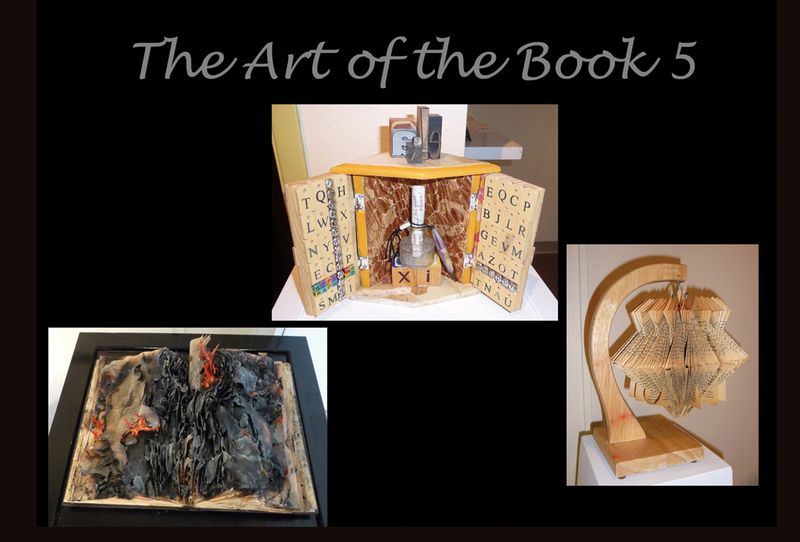 Artist Union " The Art of the Book 5"
Christina won 3rd place at the Buenaventura Gallery Open juried show. who gave a talk about his process of selecting the work. Four Inkspot members participated in a Saturday critique by Mr. McCabe. received valuable feedback and tips. Here, he is inspecting one of Karen Schroeder's prints. 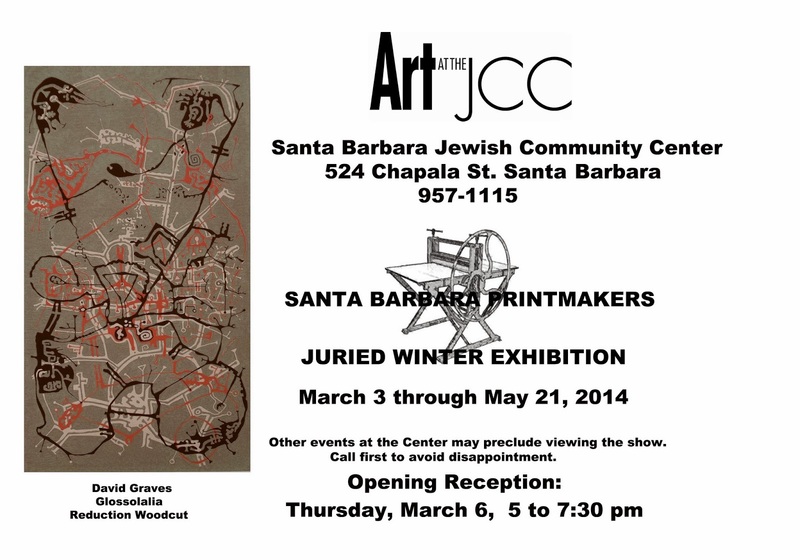 for the upcoming Santa Barbara Art Association exhibition at the Channing-Peake Gallery. 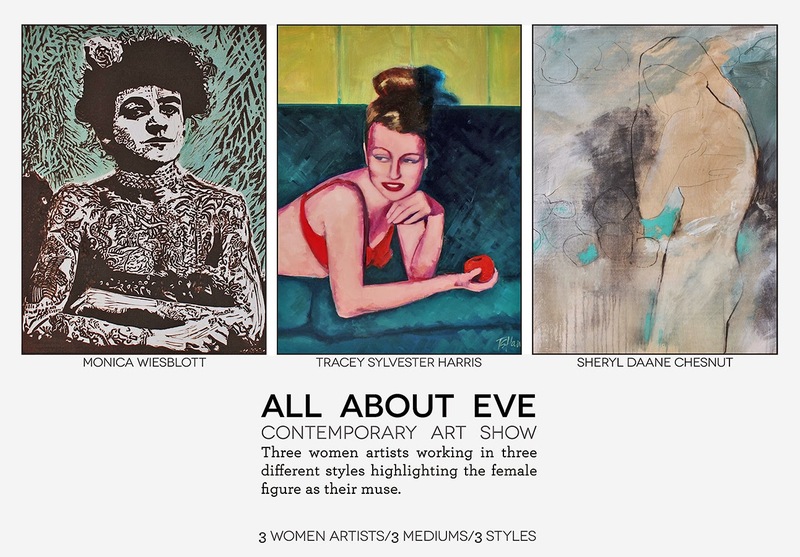 There will be an opening reception on Thursday, February 6 from 5 to 8 PM. The show will be up until May 22, with additional receptions on March 6, April 3, and May 1.